Recently launched latest android Pie or android 9.0 OS has several new features such as Navigation gestures, Adaptive battery & Adaptive brightness, Display cutout (Notch), Lock down, Volume slider and more. One of my favorite android Pie 9.0 features is digital wellbeing. 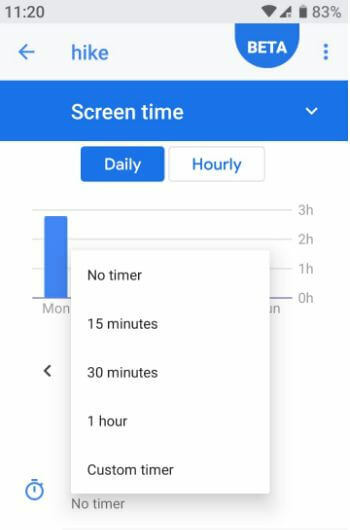 But in this tutorial, I’ll teach you how to set app time limits on android 9 Pie. These android Pie Digital wellbeing settings include Dashboard, Wind down and Do not disturb. This features already introduced on Apple’s iOS 12 OS. You can’t see android Pie’s Digital wellbeing settings in your android device. To get digital wellbeing feature on device, you must have a Pixel device running android 9 Pie. 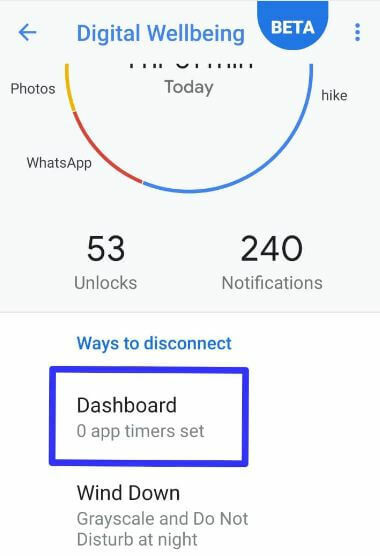 Follow below given step by step process to set app time limits on android 9 Pie. 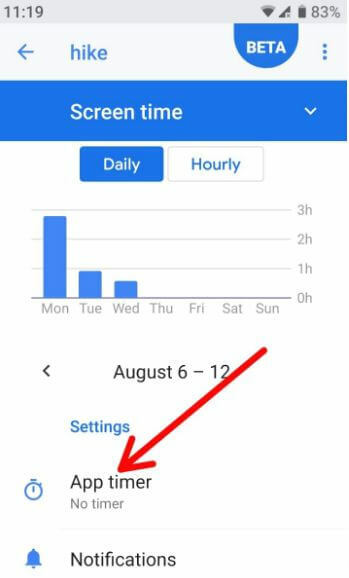 You’ll use android Pie dashboard app to set time limit on apps in Google Pixel, Pixel 2 XL, Pixel 2, Pixel XL running android 9.0 Pie devices. 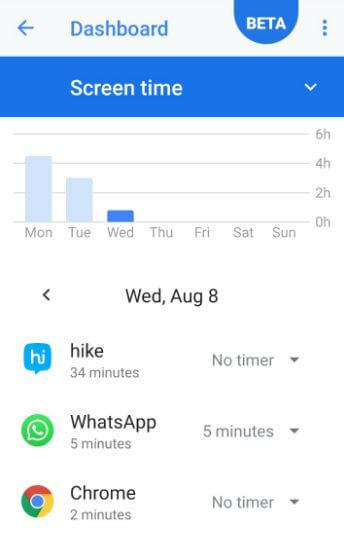 It’ll helpful to limit app usage and analyze app activity in your android 9 Pie devices. 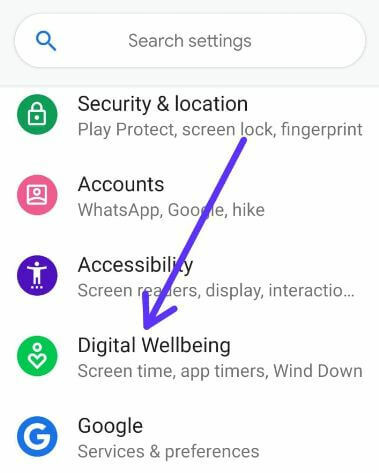 First of all get android Pie digital wellbeing beta in your Pixel devices and after that apply below given settings. Here you can see applications list without set timer in your android device. After set time limit, this message appears on the screen: Timer set to 30 minutes. 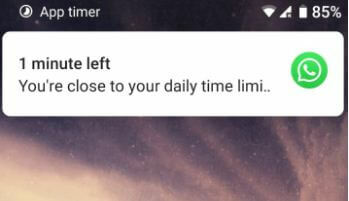 When you near the set time limit on android Pie 9.0, you’ll see notifications on status bar: You’re close to your daily time limit for apps such as Snapchat, Instagram, WhatsApp or Facebook. 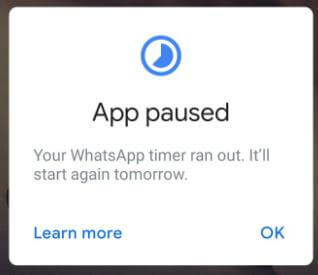 Step 7: When app timer ran out, you’ll see “App paused” message appear on screen. 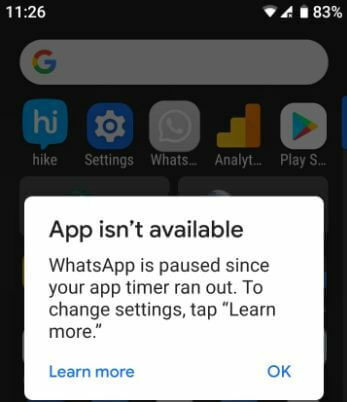 Your app is paused since your app timer ran out. To again use this app, set app time limit as “No timer” using above given settings. And that’s it. Do you still have questions about set app time limits on android 9 Pie? Feel free to leave them in the comment section below and we’ll do our best to help you out! What are your favorite features of Android Pie 9.0?